The same can be said of wedding cakes. When it’s hot and humid outside sometimes the last thing you want is a wedding cake with a whole bunch of icing. Today’s wedding cake is a perfect summer cake. Minimal icing but maximum flower power. 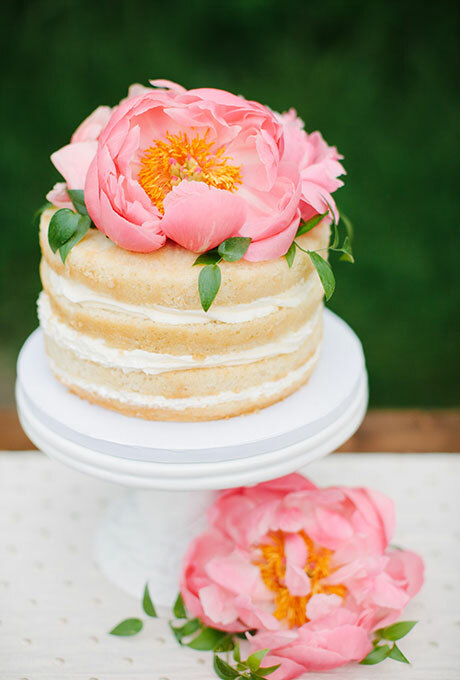 I’m loving this naked wedding cake with just the slightest hint of icing between the layers (it is technically a one-tier cake) but topped with a huge pink peony. It’s gorgeous and elegant and fun all in one. Less is definitely better here. You’ll find this wedding cake here.